Everyone knows about Grand Lux Cafe in Chicago... but most people probably don't know they have breakfast/brunch menus! The options are endless and for once, the customers aren't crowding every nook and cranny of the restaurant. I love coming in the mornings for the chance to sit in the amazing circular room that overlooks Michigan Avenue and also for some pretty good brunch options. Their food is nothing spectacular, but it is on par with most brunch places in the city. 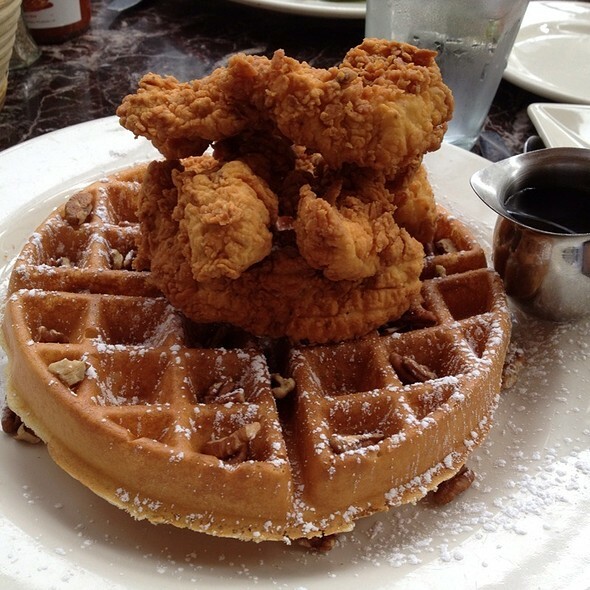 I really enjoy this southern classic whenever I have brunch in Chicago... and at Grand Lux it is different but still delicious! The waffle is freshly made and extremely thick. The outside has a nice crunch to it while the inside remains hot and fluffy! They use fried chicken tenders, which is disappointing for me, but also easier to eat. It comes with I believe 4 or 5 tenders stacked high. They serve it with liquid butter on the side (which I think is absolutely unnecessary) and also a warm maple syrup. Just pour the maple syrup generously over both the waffle and the chicken and enjoy! Please stay away from the melted butter. 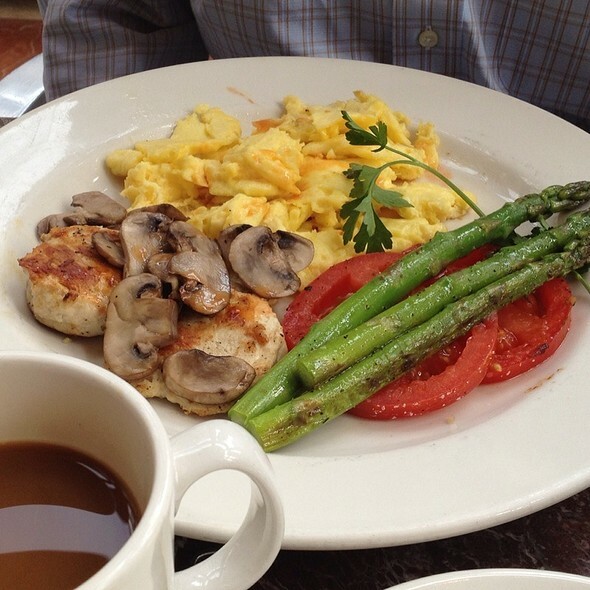 This high protein meal is served with two eggs, a chicken breast sautéed with mushrooms, and served with a side of sliced tomatoes and asparagus. They butterfly the chicken breast, making it easier to overcook, which was unfortunately how it came out. The eggs were nothing special; luckily the vegetables were more fresh than other restaurants in the city, giving the meal a nice healthy flavor. This is a build-your-own omelette option at Grand Lux. 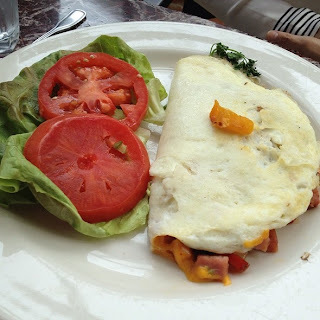 Inside this egg white omelette was ham, cheddar cheese, and a mixture of green, red, and yellow peppers. It is served with a side of toast or an english muffin and either a side of potatoes, fresh fruit, or sliced tomatoes. Like I mentioned above, the tomatoes were extremely fresh. There was nothing special with this omelette... just add some ketchup and eat with the buttered toast. Can't really go wrong with such a breakfast classic entree. At first I was skeptical when my little brother ordered this omelette for breakfast. Whenever I see crabmeat, I tend to be disappointed because of how most restaurants cut corners and use either artificial crab meat or serve 10% crab and 90% filler. 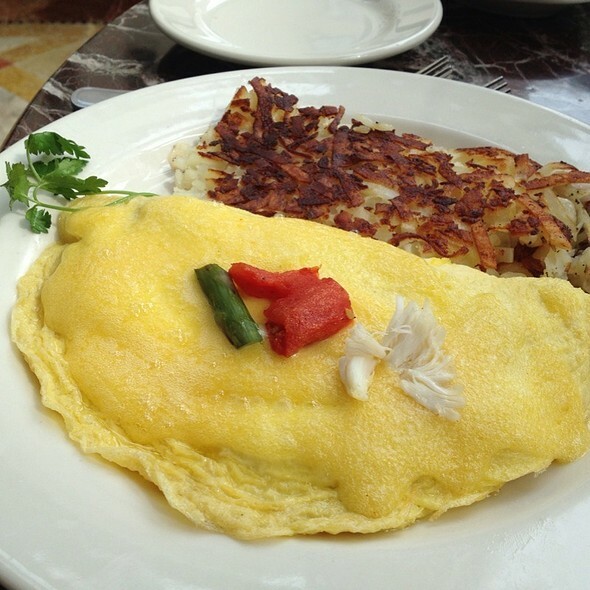 However, at Grand Lux, I was surprised to see an omelette with a significant amount of crab and freshly cooked asparagus. You could actually taste the crab! It was served with a side of hashbrowns and toast. - Do request to sit in the circular room! - A lot of people enjoy coming to Grand Lux for lunch and dinner, but I think breakfast/brunch is a great time to avoid all the crowds and still get some great menu items. - Do order their 30-minute made-to-order desserts. The beignets (sorry not pictured) are delicious and should not be missed! - Don't come with a large group on a weekend and expect to get a seat at dinner time. This place is always packed and if you come at a peak hour, you may wait for an hour or longer. It's actually surprising how many breakfast menus go unnoticed. Even the one offered by the finger food catering sydney we hired would've had the same fate if my curiosity never kicked in.